When choosing toys as a child, anything with a catchy theme tune and appealing cartoon was definitely a winner in my book, and the advert for Hungry Hungry Hippos had both. The giant colourful hippo characters doing the conga across the screen, singing ‘hungry, hungry hippos’ made a real impression on me and I was always left wanting more once the advert had finished! The game itself was just as exciting, not only did it make a ridiculous amount of noise but you could really get involved in the action. The object was to help your hippo eat the most ‘food’. This is the one area I felt the game could have improved on as the advert showed the hippos eating lots of exciting fruit whereas in the game, it was just white marbles. As a game connoisseur, I believed that a little illustration could have greatly enhanced the marble experience! One of the reasons my friends and I loved the game was that it had absolutely no educational merit. It could be cited that perhaps it helped to improve co-ordination but we weren’t aware of this at the time so loved the fact that we were indulging in pure fun without a little secret maths or real-life situation thrown in! It was also well-know to turn the most timid of children into competitive warlords, Big Brother finalists had nothing on us, all other thoughts were cast aside, nothing mattered but how many marbles we managed to collect. 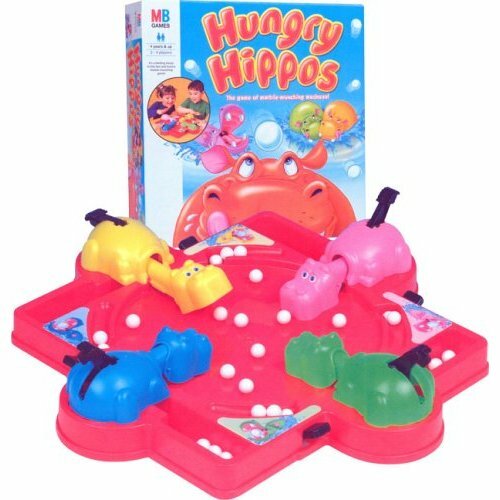 There were four Hungry Hungry Hippos on the board, each of a different colour, once you’d chosen your hippo representative all that was left to do was frantically press a button which made your hippo extend and open its mouth to try to catch as many marbles as possible. In hindsight, it’s astounding that our parents didn’t ban us from playing, as not only did the chomping hippos make a huge racket, but our heckling to cheer them on would have woken the dead too! The more the players the greater the excitement too as this definitely increased the cacophony! No real skill was involved but if you were a regular player it was possible to perfect your timing so that the hippo opened its mouth just as the marble rolled towards you. Although, even if at the end of the game you were the loser, there were no hard feelings as everyone had had an equally active part in the game! I was recently thrilled to discover that you can now get a travel edition of Hungry Hungry Hippos! Although only for two players the fun is just the same, so next time I go on holiday, I’ll definitely be whipping it out! I’m sure my fellow passengers will be thrilled to hear all the fun I’m having!